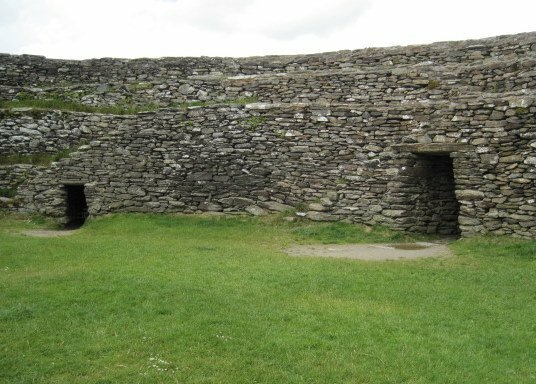 Grianan of Aileach is a magnificent, stone ringfort located in County Donegal. 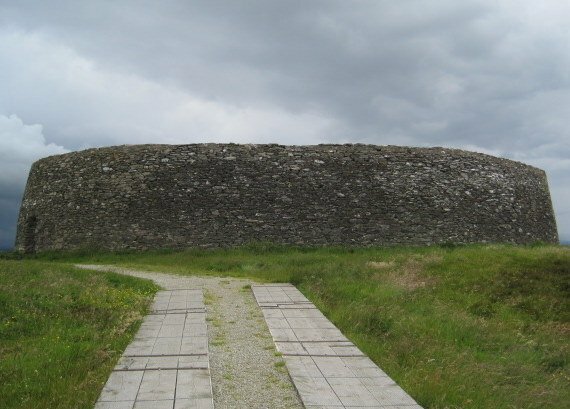 Each year we return to Ireland we visit the Grianan, which lies within fifteen miles of Letterkenny. The fort stands atop Greenan mountain, close to Donegal’s border with County Derry. 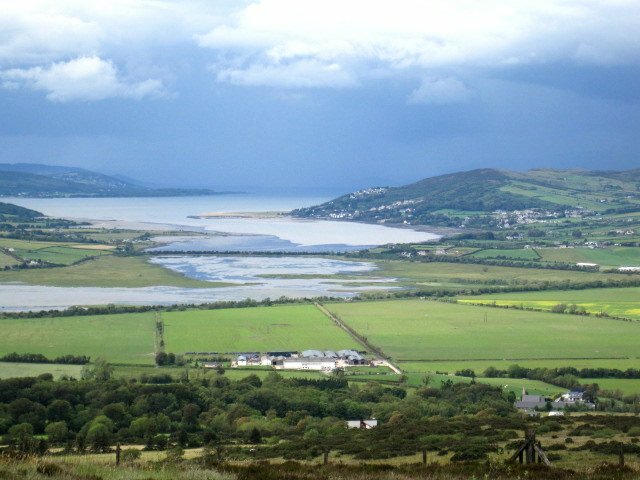 Amazing views of Lough Foyle and Lough Swilly await visitors from this blustery, windy hilltop. A threatening, stormy sky dominated this photo taken in July 2011. Our summer vacation this year was rainy, rainy, rainy. Typical Irish weather! One day my little girl came running to me, brimming over with excitement. I think she spotted blue sky once during our six week stay. 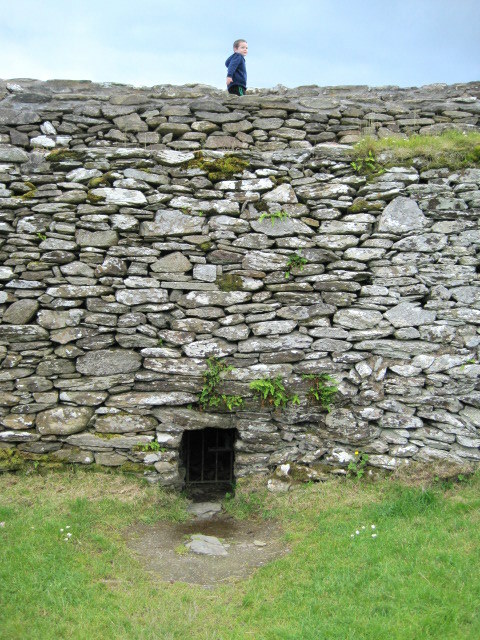 A single, narrow entrance on the outside of the fort, leads through a confined passageway into the mystical interior. 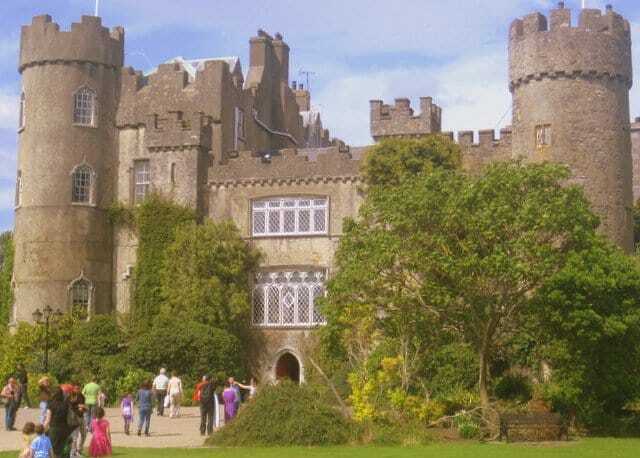 Gaelic folklore attributes building of this fortress to the great king Daghda, a leader of the ancient druids and inhabitants of Ireland, the Tuatha de Danann. Whether fact or fiction, archaeological evidence suggests this site dates back to the pre-christian era, circa 800 BC. Originally, two defensive, earthen banks surrounded the fort. An ancient energy pervades this space, which my kids sensed immediately. Once the great, royal fort of Aileach, the inner sanctum whispers of bygone mysteries. 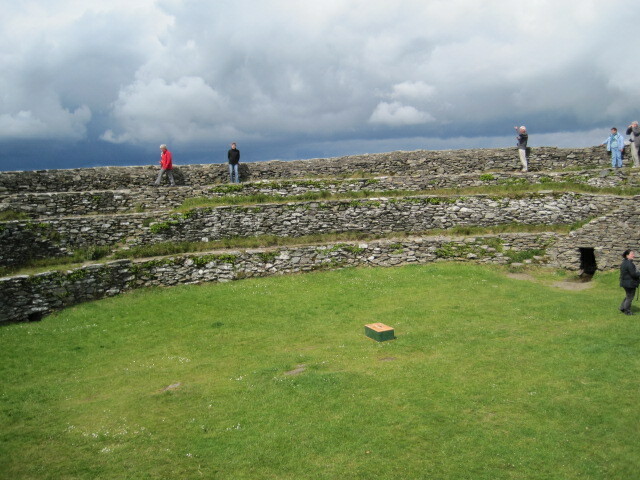 The ringfort, in a similar form to what we see today, is believed to have been built sometime between 400 and 800 AD. From this cashel or fort, the O’Neill family ruled the Fifth of Ulster. Legend claims the O’ Neill kings are buried in the center of the fort. In 1101 Murtagh O’Brien, a king from the southern province of Munster, destroyed the fort, as revenge for the destruction of his royal seat at Kincora, thirteen years previously. Between 1874 and 1879, Dr. Walter Bernard, a Derry antiquarian, directed the restoration of the fort. His vision of the original structure and design is what we enjoy today. 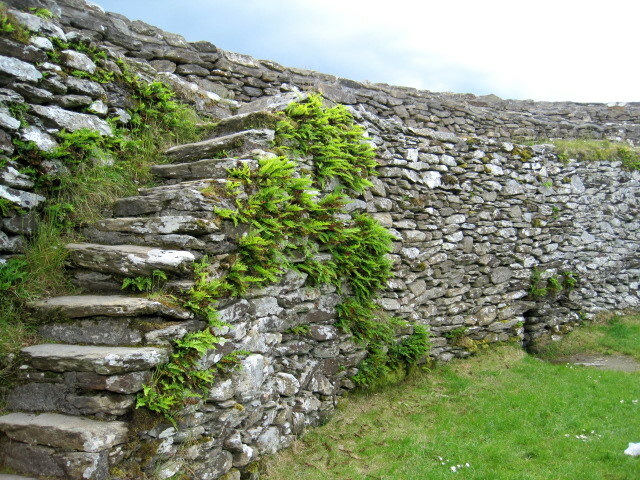 Tiered steps lead to two upper level wall walks, screaming “try me” to every kid who sets foot inside the Grianan. What a perfect backdrop for a young imagination to run wild! Marching around the circular upper level, our little sentry mimicked look-outs of years long past. A tour group arrived during our visit this year. They brought a box of white doves to release inside the fort. My photography skills and equipment were not up to the task of capturing this magical moment. But I did capture the box where the doves were kept!!! 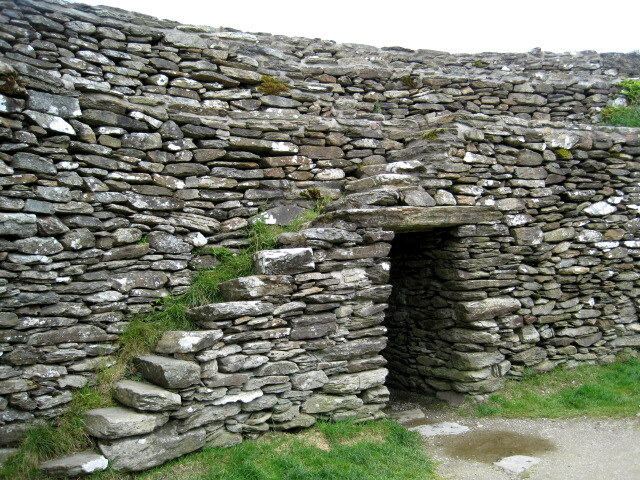 Stone portals lead to inner chambers. Luckily they are barred shut, or I am certain I might have lost an exploring child during one of our visits. The views from the top level of the fort are truly commanding, even on a dark, cloudy day. The city of Derry is only a few miles east of the fort. 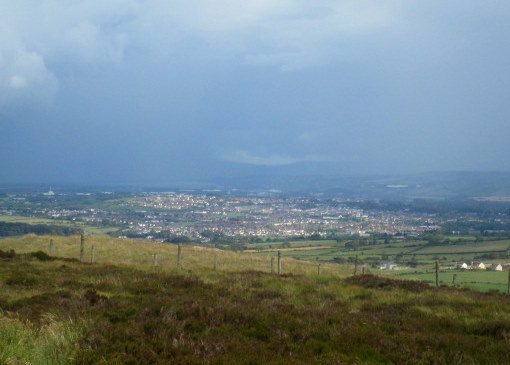 A downpour awaited the people of Derry this July day. The fort’s name has been translated as “The Stone Palace of the Sun”. Ancient myths also claim it is the palace of hibernation of Graine, the Celtic Sun Goddess. In my estimation, she picked a windy, cold spot to sleep. I had to go back many years to find this photo of the Grianan on a sunny day. 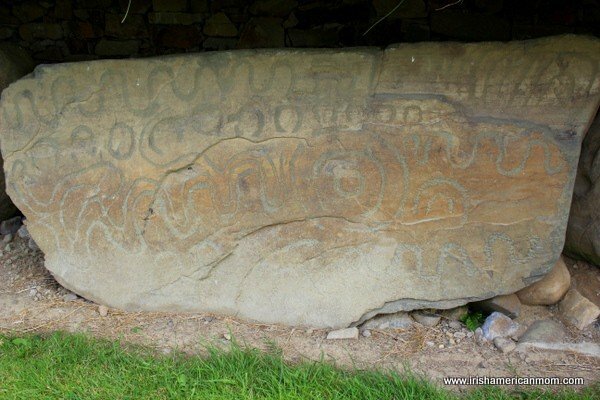 Perhaps, Donegal was sunnier in ancient times! 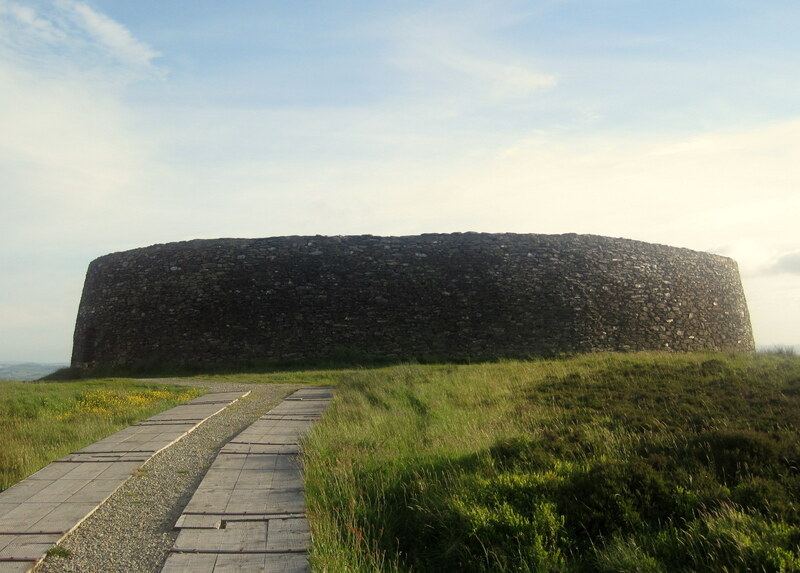 I highly recommend the Grianan of Aileach as a stop on any Donegal visitor’s itinerary. 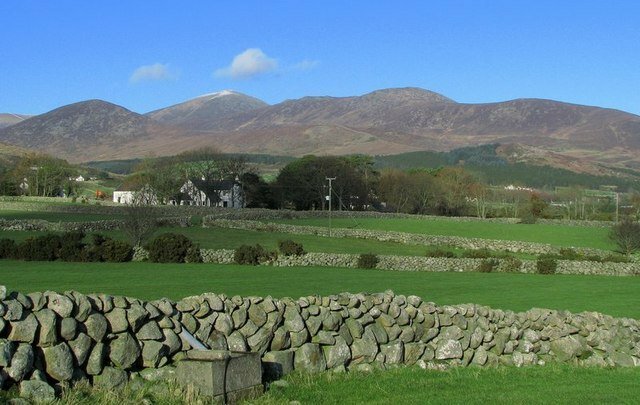 If you are lucky to visit on a sunny day, the view of the surrounding landscape stretches over five counties, and is truly breathtaking. Thanks for this information, Brian. Looks like a wonderful event. 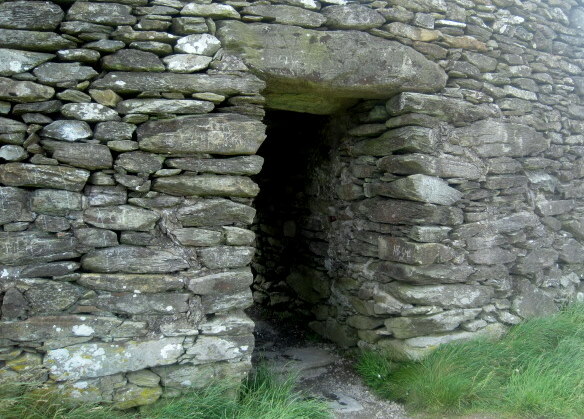 And we have Brochs here in Scottish Highlands… they are somewhat similar to this structure. Vladimir – There are many, many similarities between ancient Scottish structures and those found in Ireland. 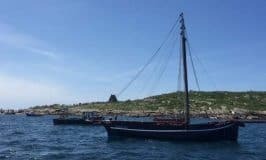 Our shared Celtic culture is clearly evident throughout both countries. Also a visit to the round church below to see the amazing stained glass windows. Candy – It really is a magnificent spot. 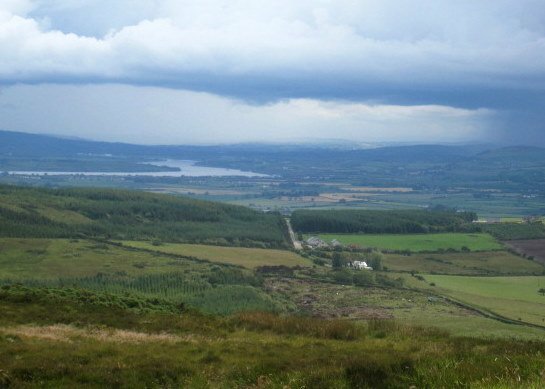 My imagination gets carried away thinking of ancient warriors watching out over the fields and the lough below. Just beautiful! 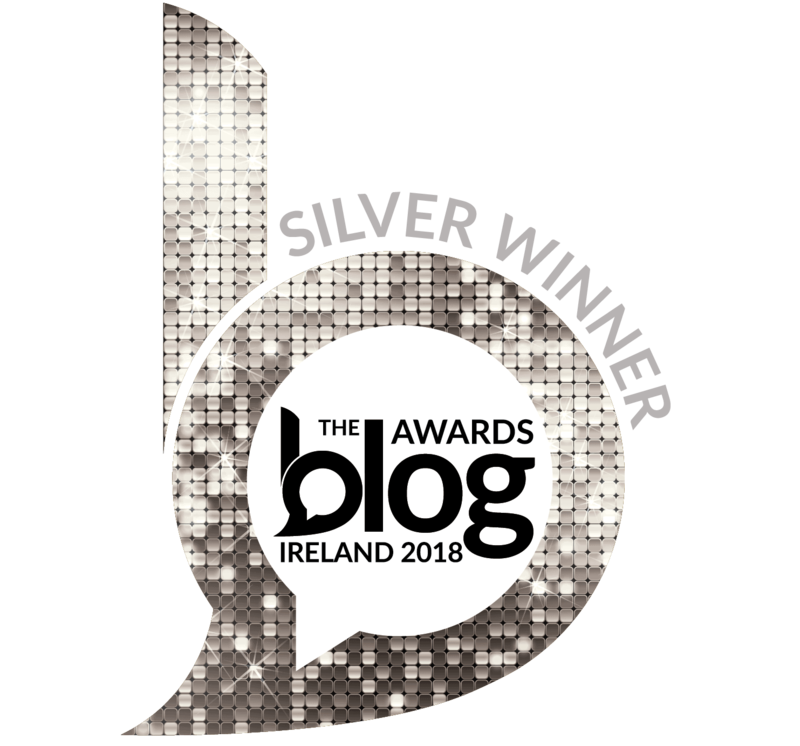 Hi Lisa – I didn’t get to visit the Grianan until after I met my husband. By then all the bars were in place. But I do remember exploring old forts in Cork as a child – lovely memories.